Monday 8/26/2013 20 00.497 S 167 44.872 W http://maps.google.com/?z=7&t=k&q=loc:20%2000.497S%20167%2044.872W posting by Barb: We approached Beveridge Reef at 7 in the morning. The wind was blowing 20 knots out of the north, great wind for sailing but not so great when trying to maneuver through a narrow east – west pass into the lagoon. The sky was grey without any sign of the sun coming out. The reef was not charted on our plotter so we were using a paper chart that we obtained from the Harbor Master in Rarotonga. So the combination of the paper chart, grey sky, rough seas and the fact that no sign of land could be seen, even with the use of binoculars made this a very unnerving navigation through a pass. As we approached the entrance we could finally see the surf and teal water on both sides of the pass. Once through, the lagoon was calmer and that gave us some comfort. We had to navigate to the other side of the lagoon to anchor in a spot as recommended by the paper chart. We could see a mast from miles away so we knew there was another boat there. We dropped anchor a safe distance from the other boat and far enough away to give them the calm and serenity that such an anchorage can provide. It was eerie to be anchored in the middle of the South Pacific with no sign of land only surf breaking all around us. It rained heavily the first day so we just made it a movie, book, reflection kind of day while we listened to the rain beating on our deck. It was the first heavy rainfall that we had experienced since the Marquesa Islands and we were happy as it cleaned our heavily salted deck. On Sunday morning we got up early and did some maintenance to the boat as we waited for the sky to clear. By ten o’clock we were in the dinghy and heading to explore a wreck of a 90 foot trawler. Dennis was in his glee climbing around in knee deep water, sending crabs scurrying, and getting wet from the surf crashing into the boat. I stayed high and dry on the stern of the wreck trying to take pictures of Dennis to capture his fascination of ‘wrecks’. We both wondered if lives were lost when the trawler ran aground on the reef. We were not surprised that such a thing happened considering that all that can be seen all around is surf. From there we dinghied to the other sailboat on the reef, stopping along the way for Dennis to do some snorkeling. After a quick hello to our neighbors, a couple from Germany, we headed back to the pass to do some snorkeling there. The current was strong so snorkeling was a little unsettling and a few times I felt panic as I had to swim hard to get back to the dinghy. Dennis, always being more vigilant, stayed closer to the dinghy. We decided to drift snorkel with the dinghy for a while. I started to notice the fish getting bigger and even saw a grey shark a safe distance below. When I came up for a look Dennis was already in the dinghy and indicated that we had drifted outside of the reef and we were in the open seas. I scrambled into the dinghy and felt the fear creep in knowing that if the dinghy outboard motor failed us we would continue our drift to Tonga as there would be no way of rowing against the current. The 2 minute dinghy ride back into the reef was probably the most scared I have been since we departed 6 months ago. We both agreed that it had been a foolhardy snorkel drift and things could have turned sour very quickly. Monday we pulled up anchor early in the morning and started our 159 mile passage to Nuie. I found the anchorage in Beveridge Reef a spiritual, peaceful and enlightening experience, as we sat in our little boat, anchored in a calm lagoon, only 500 feet from a wreck, completely surrounded by nothing but the roaring surf and the vastness of the ocean. Beveridge reef is a little oasis in the middle of the South Pacific. Friday 8/23/2013 02:30 20 31.148 S 165 50.820 W http://maps.google.com/?z=7&t=k&q=loc:20%2031.148S%20165%2050.820W Posting by Dennis: It has been a very slow passage so far. We left on Monday at about 10 in the morning. We ended up motoring for about sixteen hours. It gave us time to wake water and to top the batteries off really good. The best thing was that we caught two more tuna. So we picked the biggest one and let the other one go. The fish are a lot more fun to catch when you can slow the boat down and not just drag the fish along as the boat is sailing at six knots. So we have been eating a lot of fish again, not that I mind one bit. On Tuesday we sailed most of the day with wind starting just off the starboard bow and it has been slowly clocking around to the Southeast. By the time it is done we will have been on every point of sail. We made less than sixty mile on Tuesday a slow but nice sail. On Wednesday we made a whapping 80 miles and then yesterday we made a respectable hundred and twenty. Now the wind is off the stern and is very light and variable. The roll and banging is not pleasant at all. It makes sleeping pretty hard but we only have a hundred and fifteen more miles to go so we will make it. All in all it has been a very enjoyable sail, pretty relaxing with plenty of time to read while on watch. I even watch a movie early this morning. Well that is all for now. Sunday 8/18/2013 21 12.286 S 159 47.105 W http://maps.google.com/?z=7&t=k&q=loc:21%2012.286S%20159%2047.105W posting by Barb: We arrived in Avatiu Harbour, Rarotonga on early morning Friday August 8th. The winds were blowing hard from the North – East and the harbor was rolly and stirred up. We had help to moor med style to the concrete dock. We were squeezed in between two other mono hulls and it was not an easy feat backing in with the winds blowing 20 knots . The next day the sailing vessel Minnie B left and as they pulled up anchor we realized that they were also pulling up our anchor. We were set adrift and had to tie to our neighboring sailing vessel Dolphin of Leith until we could re-anchor. We set out our second anchor and then Dennis re-anchored the main anchor using the dingy. All of this was done in a small harbor with large swell. Our anchor was pulled a second time when the Dolphin of Leath left but this time we were better prepared for this scenario and also had our second anchor out. So the med style anchorage in Rarotonga is not ideal largely due to the minimal amount of space for sailing vessels but it is a beautiful island and worth the anchorage challenges. Rarotonga is luxuriantly green and the people here are extremely welcoming and friendly. It is great to be in an English speaking country again. There are many NZ tourists walking the dock and all are eager to hear the cruisers stories. We have managed to get invitations from several NZ people to come visit them when we arrive on their island. There are currently 9 boats here including us in this small square basin so it does encourage socializing and we have met some great people. We spent a few days next to a wonderful family of 4, mom, dad and children aged 2 and 4 on the Dolphin of Leath. The boat is a 106 years old 30 foot wooden boat and it was sailed all the way from the UK on the way to New Zealand as well. We rented a scooter for a day and got to see the island in its entirety. We traveled on the main road, side roads and a few dirt roads that threatened to take our muffler a couple of times. No scooter adventure would be complete unless we could get the bike dirty. We completed the cross country hike which included a climb up Te Rua Manga (the Needle) and a return trip from the other side of the island on the cross country bus. We did the hike with our friends Kirsten from SV Silhoutte (heading back to Seattle via Hawaii and Alaska) and Anthony from SV Wild Fox (also heading to New Zealand, solo sailing) and shared many a chuckle. The hike was much easier than the Bora Bora hike and I felt in much better shape this time, maybe because we weren’t trying to keep up with 20 year olds. We have eaten out often and for the most part the food has been very good. But our favorites have been the Boogie Burger which was a double homemade patty served with Ketchup, cheese, bacon, lettuce, tomato, shredded carrot, beet and a fried egg. It was an interesting combination and very good. We also had a fantastic dinner at a small restaurant outside of town, by the airport called Nu Bar and Bistro. My steak dinner was so exceptional that I had to personally thank and compliment the chef. And of course, we have enjoyed the many Happy hours at the bar and on the boats with our friends. Tomorrow we leave here and head to Beveridge Reef, 465 miles away. The winds are supposed to be light so it will probably be a slow sail. It will be interesting to see which anchor we pull up besides our own. Our neighbour SV Wild Fox will be leaving at the same time so we hope that is one less anchor to worry about. Wednesday 8/7/2013 07:30 19 13.514 S 156 53.302 W http://maps.google.com/?z=7&t=k&q=loc:19%2013.514S%20156%2053.3027W Posting by Dennis: We left Maupiti a couple of days ago, planning on going to Maupihaa but the wind was out of the southwest which made the very narrow pass just too risky to do. So we continued toward Rarotonga, which is an additional 425 miles to the southwest. Rarotonga is the largest of the Cook islands and it is were we need to clear customs. The wind has gone from out of the northwest, to the southwest and now from the southeast, so we started out doing a tight beat and have gone around so now we are running with the wind just off are stern. Until now it has been blowing fifteen to twenty knots but now it is only about eight knots which makes for a very slow sail. The day before yesterday just as it was getting dark we caught two Wahu at the same time. We let the smaller one go. My fish cleaning skills are definitely improving. So we have been eating fish ever since. Thursday 8/8/2013 12:30 20 36.691 S 158 45.311 W http://maps.google.com/?z=7&t=k&q=loc:20%2036.691S%20158%2045.311W We are still plugging along now at about three knots, which is ok because we would have arrived in the middle of the night now it will be closer to morning. We have been eating some form of fish now for every meal. Barb made some fish chowder yesterday, it is really good and I am looking forward to having it again tonight. She even baked bread yesterday since we were not rolling around too much. If anyone can tell me why our bread always gets so dense please do. It rises and when we punch it down it does not seem to rise the second time. It tastes good but it is not for sandwiches, that’s for sure. All in all it has been a pretty pleasant sail. Not anything very exciting has happened. We have had plenty of time to read and just sit and look out over the endless sea. Friday 8/9/2013 10:00 21 12.286 S 159 47.105 W http://maps.google.com/?z=7&t=k&q=loc:21%2012.286S%20159%2047.105W Arrived at Avatiu, Rarotonga, Cook Islands early this morning and am in the process of clearing customs. We had to do another motor from Bora Bora to Mautipi, about 27 miles. It gave us a chance to fill up the water tanks, heat some water, take long showers and wash clothes. It was amazing how wonderful it was to take a hot shower in the cockpit without much thought about how much water I was using. The pass into Maupiti has a poor reputation because in rough conditions it can be hazardous. We came through while it was calm and it still looked daunting to me as the waves crashed on the coral nearby. Two days later another sailing vessel came through the pass with full sails and they ended crashing into one the channel markers. It made two large gashes above and at the water line. It also ended up blowing out their jib sail with the force of the impact. Dennis and I noticed that they were in trouble as soon as they anchored nearby. Dennis dingied over and spent an hour or more helping them get their sail down which seemed to have snagged high on the mast. They will probably be here a couple of weeks fixing the 2 large gashes on the side of their boat. These incidents make us appreciate how far we have come and it makes us realize how quickly things can change. We take nothing for granted. 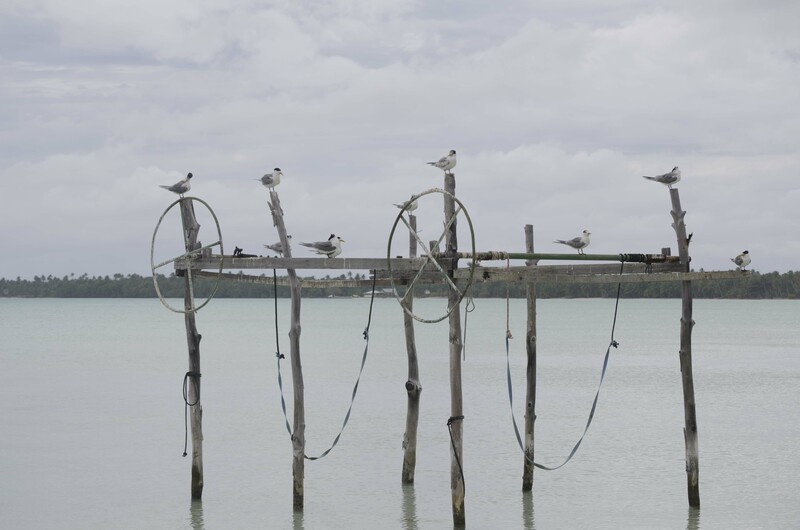 Maupiti is a beautiful, quiet, peaceful island. We got a chance to walk and dingy around the island, walk the beautiful white beaches and snorkel with huge Manta rays. There were only 6 boats anchored here so it was very different from Bora Bora. There are several tourist Pensions here which are quaint and beautiful and much cheaper than Bora Bora. 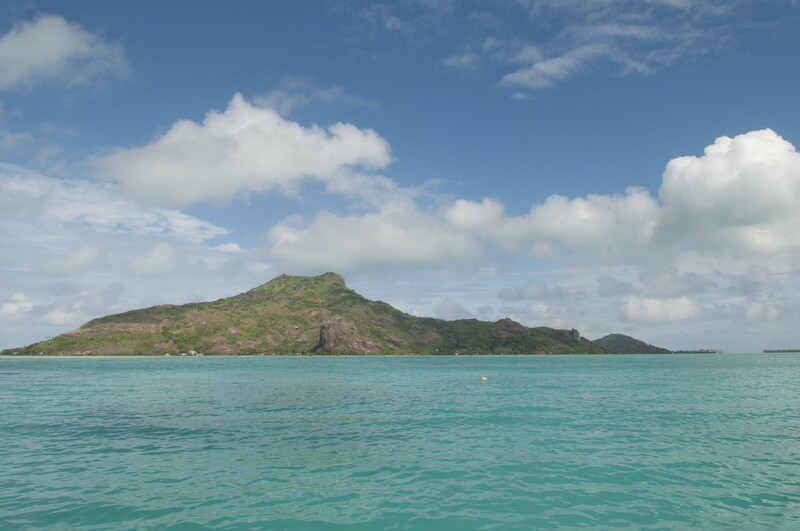 The winds today are calm and we have decided to leave for the last of the French Polynesian islands, Mopelia. The pass into Mopelia is supposed to be one of the trickiest because it is very narrow and the ebbing current can reach 6 knots. It will probably be another 100 mile motor but if we had the winds for sailing it would probably make the pass dangerous.